Cast: Rani Mukerji, Supriya Pilgaonkar, Shivkumar Subramaniam, Neeraj Kabi and Sachin Pilgaonkar. Rani Mukerji is back to films and she has surely never disappointed in terms of her performance. 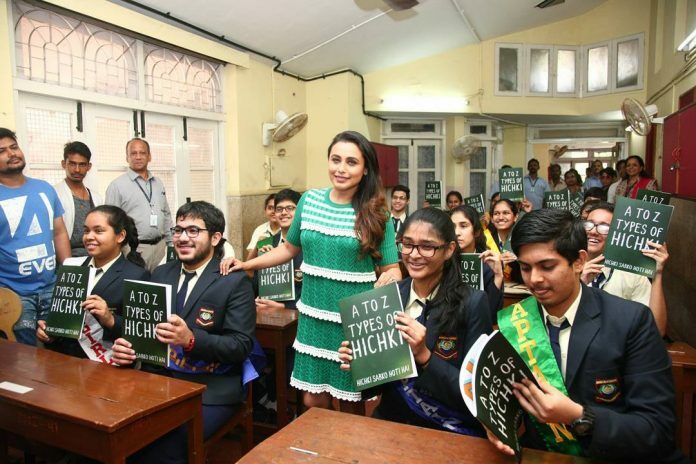 Hichki is a story about a teacher Naina Mathur played by Rani, who suffers from Tourette Syndrome, which is a neurological disorder. After numerous interviews and rejections she finally lands her dream job of a full-time teacher but has been assigned a group of students who are a part of Right to Education initiative and cannot keep themselves away from trouble. The students do not leave any opportunity to mock their teacher, who has decided that she is going to succeed against all odds despite her disorder. The concept is surely new and Rani has fit perfectly in the character. The makers have conveyed an idea that just became you are not normal that does not mean you cannot fit in or succeed. The filmmaker has surely done a great job in terms of execution the only drawback is the screenplay. The first half is spend just building up the story while the second half raises the drama quotient. Rani has effortlessly taken up the Tourette Syndrome side effects. Not to forget a bunch of young actors who make the 9F class, who have done a great job as well. Harsh Mayar, who plays Aatish the leader of the mischievous bulk, has performed well. The story also talks about Naina’s struggles and her conflicting relationship with her father. The film is full of drama, but that does not mean it is not recommended and is definitely worth a catch. Despite all the shortcomings, the film has got freshness, emotional intelligence and a lesson to learn that life cannot be a bed of roses and everyone has to fight their individual fight with life despite all odds.